I knew right away the Cup Of Noodles wasn’t from around here. 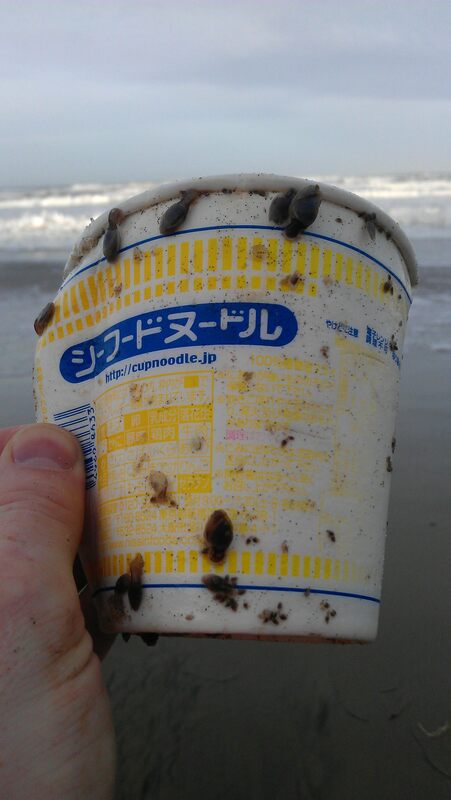 Although I couldn’t be completely sure, the ‘.jp’ suffix on the package’s website address was a clue that this piece of styrofoam, lying on a beach near Newport, once held cheaply made noodles most likely mass produced, distributed, and eaten in Japan. 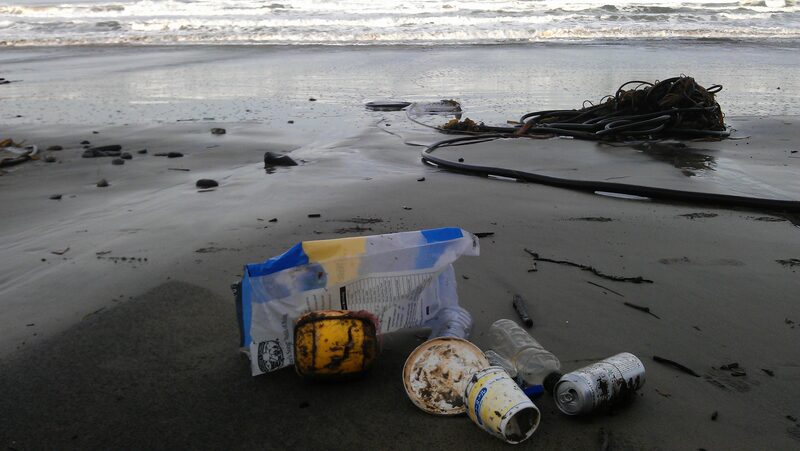 Along with thousands of pounds of other tsunami debris, this poor, lost, and scared styrofoam cup washed up on an Oregon beach 6,000 miles (and a year and a half) from home. It’s a testament to the indestructibility of modern product packaging. It was just one little cup in a bag of litter I had collected thanks to the ingenuity of a park manager just down the beach. She or he had created a wooden board, carved a few holes, then rolled up and pushed recycled bird seed bags into the holes which people could take and fill with litter from the beach. It’s remarkably simple, inventive, and effective. After having felt a few extraordinary 70+ mph coastal winds the other night, I can attest that this little bag holder works well even against the ferocity of an ocean storm, as all the bags were still intact. Aside from the misplaced Cup Of Noodles, the rest of the litter in my bird bag was probably purchased right here in the United States, by someone shopping on any day of the year. Maybe even Black Friday. Most everything we purchase ends up in a landfill, along the side of the road, on a beach, or in the ocean. Walk almost anywhere and you’re likely to see trash. Whether it’s the packaging from the things we buy on Black Friday, the containers we use to hold our drinks, or the food packaging we throw away after a hard day of shopping, it all goes somewhere. It is possible to slow the accumulation of plastic. We can reuse shopping bags or request paper sacks, buy locally from a farmer instead of packaged foods, buy less, or simply not buy it at all. .. if we’re willing to listen. 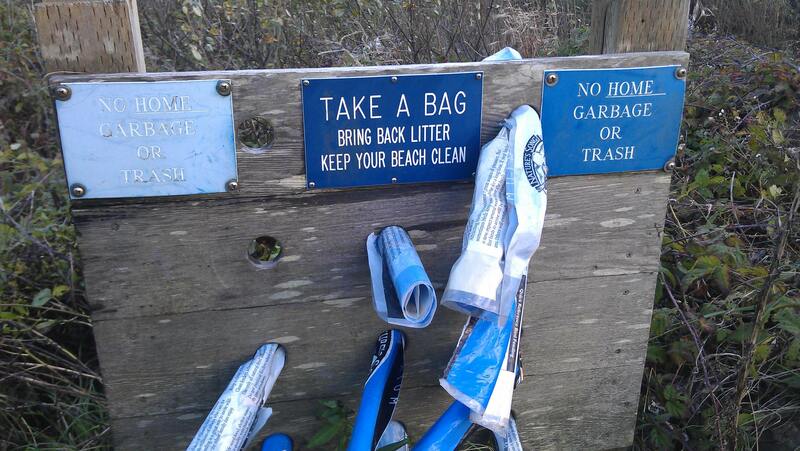 Yesterday’s gift of time … Picked up litter on the beach. This entry was posted in In the world and tagged Black Friday, buy local, Cup O Noodles, environment, garbage, Japan, litter, product packaging, recycle, reuse, tsunami, tsunami debris. Bookmark the permalink.